You will not find a nicer place to stay while you're relaxing and enjoying all that Door County has to offer! This cottage is perfect for family gatherings or an intimate destination vacation. It is a retreat where time can seem to stand still and where you can redefine family and friendship in ultimate comfort. This is a new and uniquely designed 1,600 square foot home designed in the classic coastal cottage style with a contemporary twist. Every possible amenity is available on site or within walking distance. The Marina Cottage guests enjoy the full use and benefit of the adjacent CenterPointe Marina club house and pool facilities, which include both an outdoor pool as well as an indoor pool - ideal for year round use. The private club house includes a 2,000 square foot lounge on the second floor that can be used for private parties or corporate meetings. There is only one place where the glistening waters of Lake Michigan and Green Bay meet in a protected harbor... Sturgeon Bay, Door County. It is here beside the water's edge where you will find a private residential community that blends the boating lifestyle with nature's beauty, fine cuisine, shopping, museums and all of the conveniences of a small town. If you fall in love with the Shipyard lifestyle you can purchase one of our homes or condominiums. Lakefront: The unobstructed views from this cottage are unmatched. One can watch the sunrise over the Bay View bridge to the east and the sunset over the Michigan Street Bridge to the west. There is a constant parade of boats gliding by as boaters travel from the lake to the bay. This is an ideal setting for large family gatherings or simply a quiet weekend get away. For additional information on the Cottage as well as the surrounding neighborhood, please check out our website and enjoy the many possibilities. Our family friendly cottage is available throughout the year with no black-out dates. Whether you enjoy summers on the water, checking out the fall colors or are simply looking for a winter get away, our cottage is perfect for the occasion. Our deep water marina can accommodate yachts up to 250 feet in length with a minimum draft of 15 feet. Kid Friendly: The Marina Cottage is very kid friendly and is an ideal set-up for a fun family vacation. The association amenities such as the swimming pool are located immediately to the east. Safe, quiet neighborhood two blocks from downtown Sturgeon Bay. Additional Amenities/Details: Full Kitchen: The cottage has a fully equipped kitchen featuring stainless steel appliances and granite counter-tops. All dishes, stemware and utensils are furnished along with the pots & pans. Cooking Utensils Provided: A full set of utensils is included. Gas/Electric BBQ Grill: Gas grills provided for each cottage as well as high quality Vermont Castings grills located at the clubhouse just steps away.... Deck/Patio: Each cottage features a partially covered patio with views over the marina and Sturgeon Bay's wonderful sunsets. Balcony: The cottage features a second floor balcony with deck chairs to relax and enjoy the sunsets as the boats glide by. Growing up in Wisconsin I used to spend many summers in Door County with my grandparents who were avid boaters. When I got married my wife and I were once again drawn to the waters of Door County and have been spending our summers with the kids 'up north' for the past 18 years. 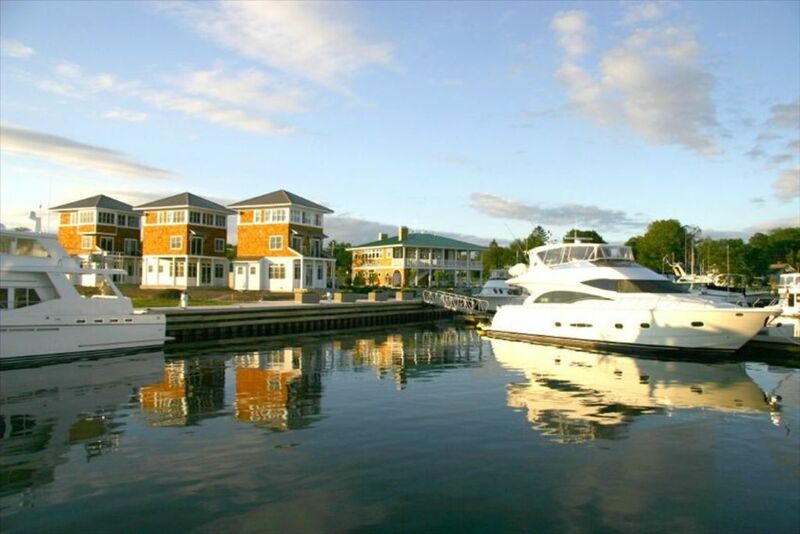 In 2004 along with a business partner and friend we created The Shipyard, a unique waterfront community in the heart of Sturgeon Bay and CenterPointe Marina, a world class boating facility unmatched in the Great Lakes. To ensure that all members of the public could enjoy the lifestyle we created, we built what are known as The Marina Cottages and offer them throughout the year on either nightly or weekly rentals. We chose Sturgeon Bay because of its location in Door County and because of its unique access to two great bodies of water, Lake Michigan and the bay of Green Bay. Situated in the heart of town, we are only blocks from the library, hospital, YMCA, post office, many churches and all of the shopping and dining we need. Your private master bathroom adjoining the master suite is finished with granite counter tops and ceramic tile floors. We want to make sure that your stay with is a comfortable one. As you get ready for your vacation the less you have to pack makes life a lot easier. This is why in each bathroom you will be supplied with bath towels, wash clothes and hand towels hand soap, make up remover wipes, shampoo, conditioner, body wash, hair dryer and paper needs. If you run out during your stay we would be more than happy to bring some extras to you. The unobstructed views from the Marina Cottages are unmatched. One can watch the sunrise over the Bay View bridge to the east and the sunset over the Michigan Street Bridge to the west. There is a constant parade of boats gliding by as travelers traverse from the lake to the bay. Thermostat controlled central air conditioning control panel is located on the first floor. You will have control over your thermostat in your cottage. Thermostat controlled central heating control panel is located on the first floor. You will have control over your thermostat in your cottage. Complete sets of linens will be made up on the beds in the master and 2nd bedrooms. Extra linens and pillows for the pull out sofa are in the laundry closet lower cabinet. Each cottages has its own washer and dryer. A central laundry facility is located in the clubhouse building as well. In your laundry closet you will find laundry detergent in the drawer. Each cottages has its own washer and dryer. An outdoor fireplace with wood provided is a wonderful place to roast marshmallows with kids or have some drinks and adult conversation. Driveway parking available adjacent to cottage. Two hanging sets of towels (bath, wash and hand) and two extra sets of towels in the cabinet under the bathroom sink are provided. Our fitness room is located in the indoor pool facility. You are free to make use of this room at your leisure 24 hours a day 7 days a week. Dishwasher detergent is provided for your use and is located under the kitchen sink. A full size refrigerator with upper freezer will hold your beverages and food for the entire family during your stay. A sample of Door County coffee will be ready for you to brew as you wake up to the views of a beautiful Door County waterfront. If you choose to cook, dinnerware for 8, wine glasses, utensils, coffee cups, water glasses, mixing bowls, cake pan, cookie sheets, pizza pan, pots, pans, measuring cups and spoons are yours to use. Each cottage has a fully equipped kitchen featuring stainless steel appliances and granite counter-tops. All of your dishes, stemware, utensils will be furnished along with pots and pans. There are flat screen TV's located in the master bedroom as well as the upper level den/family room of each cottage with standard cable package. Each cottage features a second floor balcony with deck chairs to relax and enjoy the sunsets as the boats glide by. Each cottage features a partially covered patio with views over the marina and Sturgeon Bay's wonderful sunsets. The Shipyard homeowner's association outdoor pool & clubhouse are located immediately next door. The indoor pool & fitness center are located across the street. The indoor pool and fitness center creates a great place to get out of the summer sun or dodge inclement weather as a squall passes through the county. For those who don't want to swim, there's a 58' flat screen TV and a full complement of the latest fitness equipment! Washer: Each cottages has its own washer and dryer. A central laundry facility is located in adjacent clubhouse building. Parking for RV/Boat/Trailer: RV, boat and trailer parking available across the street. Cable/Satellite TV: There are flat screen TV's located in the master bedroom as well as the upper level den/family room of each cottage with standard cable package. Shared Hot Tub and Pool: The Shipyard homeowner's association pool & whirlpool are located only a few short steps away. The indoor pool & fitness center are located directly across the street. With the hot tub which I notified office staff. Stephanie was fast to get back with me the status. Would highly recommend this property. Although we only stayed 1 night in the Waterfront cottage it was definitely an awesome mini vacation. The Cottages are modern and clean with a ton of space. Views were amazing and the location is right next to every downtown activity in the Sturgeon Bay area. For the price you will not find a better modern home. Door county has a lot of properties for rent but not brand new modern units with space and views. If you do find a property on the water it usually rents for $700 a night. On a cold winter day it was great to wake up to the beautiful sunrise and all of the natural light in the condo. We’ll be back! You were fantastic guests. Thank you for being very respectful of our cottage, leaving it spotless and tidy after your stay. We would love to welcome you back any time. Thank you for staying with us. This gem exceeded our every expectation! Everything about our stay at this property exceeded our expectations. It was the perfect choice for our family of 3 adults and 3 kids for a winter getaway. The apartment is very spacious, nicely decorated and well appointed with every comfort of home - even a washer/dryer, which really came in handy. The location is fantastic, with beautiful views of the water and harbor while being only a short walk to all the restaurants and shopping in the quaint town. Then access to the indoor pool and fitness center put our whole stay here over the top. That great amenity was thoroughly enjoyed by all of us - the hot tub, especially, felt heavenly after our fun days out in the snow. We'll definitely come back to enjoy this outstanding gem again. Thank you for making our first visit to Door County a great one! Thank you so much for the wonderful review. It is amazing to hear about your exceptional stay here in Door County. Bob, you and your family were the perfect guests. Communication with you was very easy from beginning to end. You took great care of the the cottage during your stay, leaving it in perfect condition. I highly recommend you to any other host and would be very happy to welcome you again anytime! Thank you very much again Bob, for having chosen our cottage for your stay in Door County. By far the best rental property we have stayed in. Right on the water at the marina. Morning coffee on the deck at sunup was the best. Besides the view, the interior was very nicely decorated with all the amenities. Just a short walk to great restaurants and concerts in the park . You won't find a better place to stay while in beautiful Sturgeon Bay. 40 feet from the water's edge, our cottages are adjacent to the world-class CenterPointe Marina in Sturgeon Bay, Door County, Wisconsin, USA. Sturgeon Bay is a year-round vacation destination. Whether you enjoy summers on the water, observing the fall colors, or are simply looking for a winter getaway, the Marina Cottages are perfect for any occasion. From the beautiful parks and outdoor concerts to the museums, galleries and shopping districts, everyone will find something they enjoy in Door County. If you’re looking for an activity filled getaway, or a leisurely week on the water – You won’t find a nicer place to stay than the Marina Cottages! Please call for special deals and promotions!